Saturday, February 11, 2017, marked the official North American launch of the Giya G1 Spirit loudspeaker from the UK’s Vivid Audio. The invitation-only event for selected members of the media and the public was co-sponsored by U.S. importer Philip O’Hanlon of On a Higher Note and Prof. George Vatchnadze, who is the owner of Kyomi Audio in Chicago, the head of the Piano Department at DePaul University, and a touring concert pianist. 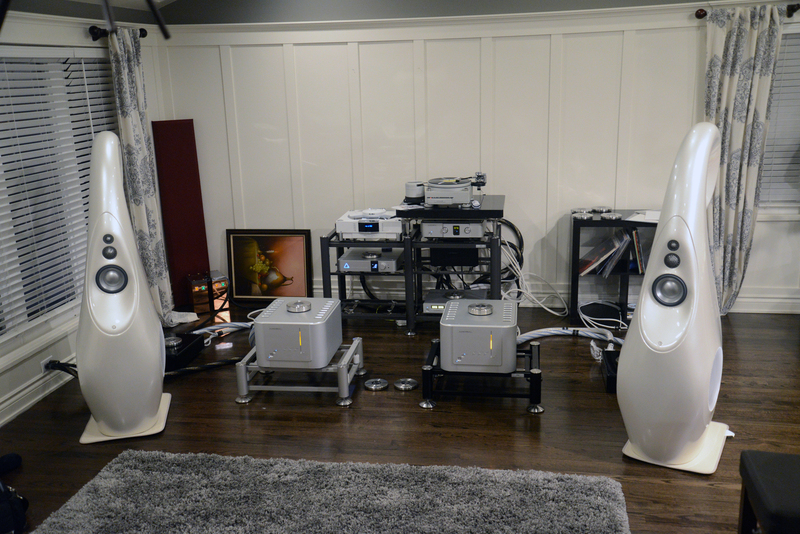 Reflecting a decision to skip the typical launch venue of CES, the event was held at the home of long-time audiophile Mario Presta, in Itasca, IL, a northeastern suburb of Chicago located eight miles west of O’Hare International Airport. 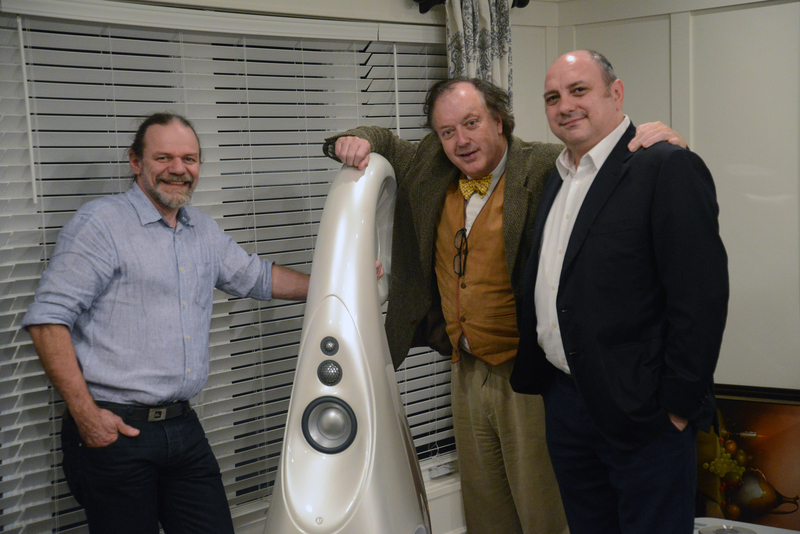 Laurence Dickie, Vivid Audio’s designer and technical director—and the mind behind the famed B&W Nautilus loudspeaker—was on hand to give a presentation and answer questions about the new G1 Spirit, a model a step above the standard G1 that remains in production. The new woofer, known as the C225-100, employs a completely new die-cast structure with a voice coil increased in diameter from 75mm to 100mm, and that is also 50% longer, thereby lengthening the magnetic gap. It also reportedly improves linear excursion by 30% while doubling thermal power dissipation. This reimagined woofer forced a complete reworking of Vivid’s distinctive exterior shell, resulting in a structure that is 4 1/2 inches shorter and 2 inches wider than the prior enclosure. The cabinet change brings the entire front-mounted driver array some 8 inches lower on the front baffle, features a completely new, longer, and wider port for increased linear LF output, and introduces lower-mass CNC-machined sandwich-composite stiffening braces. The updated lower midrange driver, the C125-100, also received an overhaul, including a 75mm voice coil, a highly revised magnet topology, and a new chassis to support its fresh magnet system. It also now employs the same carbon-fiber peripheral stiffening ring designs used in the 2" D50 upper midrange driver and 1" D26 tweeter. The result has been a dramatic performance improvement—including a higher first break-up point of 10.5kHz, up from 4.3kHz. The D50 and D26 drivers both use a catenary dome profile (think of the curve made by a chain suspended between two points) rather than the more typical spherical profile, and sport a new perforated grille in place of the wire cross used on the original G1 drivers. The final significant change includes a move to outboard crossovers that make connecting large sets of speaker cables much easier, in addition to facilitating the use of “active” configurations. The system driving the new Vivid Audio Giya G1 Spirit ($93,000/pr.) was clearly up to the challenge (see photo below). Front end sources were either a TechDAS Air Force III turntable ($29,750) with a Graham Elite 9" tonearm ($12,000) and a Koetsu Jade Platinum mc cartridge ($10,000), or an MBL 1621a CD transport ($28,000) with the Merging+NADAC Player MC8 music server/DAC ($14,000) running Roon v1.3. Electronics included the Luxman EQ-500 vacuum-tube phonostage ($7500), a Luxman C-1000f control amplifier ($35,000), and a pair of Luxman B-1000f monoblocks ($60,000/pr.). Equipment isolation stands included the Artesania Exoteryc Tandem stand ($9990), the Artesania Krion turntable platform ($3390), and a pair of Artesania Air amp stands ($3690 each), while cabling was all from Stealth Audio: the Śakra V12 interconnects ($12,000 per 1m set), the Dream V16 speaker cables ($14,700 per 2m set), the Sextet AES-EBU digital cable ($4400/1m), the Helios phono cable ($9800/1m), and a number of the Dream V16 Uni power cords ($5200/1.2m). After recording some interviews, Mr. Dickie delivered a very engaging presentation aided by a PowerPoint slide show. Other notable attendees included Mr. Mark Maryanovsky (cellist for the Indianapolis Symphony Orchestra and owner of Tone Studio), Serguei Timachev (Stealth Cables), and Dr. Craig Buckles (Magnan Cables). Mr. Dickie also employed a couple of “sonic” aids to demonstrate certain materials and how they can impact sound-wave behavior. For one, he presented a sample of a molded, tapered tube absorber to show how effectively those tubes can tame and minimize the detrimental properties of the drivers’ rear-waves. He also played a tiny hand-cranked music box, first in the air, where it was nearly inaudible, and then again with its base resting flush on the surface of a wall, where its sound was nearly four times, or approximately 20dB louder. After inserting a layer of composite material—the same kind used to isolate the speaker’s drivers from the enclosure—between the music box and the wall, he played the box a third time. This time, the output was significantly diminished—far more comparable to the sound from playing in the open air than the flush-on-the-wall output. This effectively demonstrated the need to isolate the drivers within the enclosure itself. The scheduled listening sessions, especially early on, proved to be very underwhelming. For a number of reasons, the loudspeakers’ arrival in Chicago had been delayed until the Tuesday before the event. Further, when I arrived at 10:40 a.m. on the event day, the system was still not fully assembled. Neither the turntable platter nor some single-ended ICs were in place yet. So when the listening began, the speakers had something like 100 hours of run-in and the system itself was freshly set up, having had no time to settle. As a result, bass and midbass were bloated, slurred, and without definition—a function of both speakers not being spiked to the suspended wooden floor (recall Mr. Dickie’s earlier music box demonstration) and room interaction. Dynamics were congested and slurred. Midrange, however, was tuneful, gaining in tone color and texture as the day wore on, but was not especially noteworthy. Treble was muted and unarticulated. Images were diffuse and staging not very specific. In all, exactly what you’d expect from a freshly assembled, hastily set up, new-from-the-box system. The system got progressively better as things settled in, and by late afternoon much improvement had been realized. But it wasn’t until long after the official event had ended that things took a major turn for the better. At 8:30 p.m. George asked me if I had ever heard “the Nautilus Effect.” When I told him that I was unfamiliar with it, he asked if I was up for some experimentation. I said I felt we had nothing to lose by attempting any change in setup, so he began to rearrange the speakers. I was in the listening seat ready to provide feedback. Apparently this is a fairly common set-up practice (with the Nautilus) in the typically smaller rooms in Japan, but it proved to be even more extreme here. 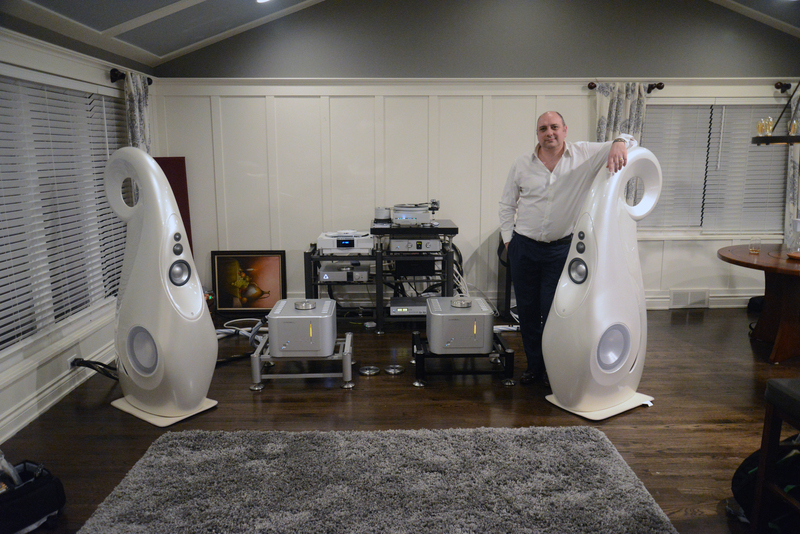 Two Nautilus loudspeakers could be placed directly facing one another, a full 90 degrees inward away from straight ahead and, thanks to their exceptional dispersion, the result would yield a near-omnidirectional presentation. For our purposes, George ended up placing the new G1 Spirit about 9 or 10 inches further into the room, away from the backwall, and with an extreme toe-in angle—something on the order of about 40 degrees inward from straight ahead (see photo below). This modified setup demonstrated that the Spirit had very good dispersion characteristics, and with that extreme toe-in, we had managed to greatly reduce room interactions. Although we gave up some upper extension and air, the system had snapped into focus. Displaying far less of a masking effect, the slurred bass also improved considerably (though not entirely). In this configuration, there was body, space, bloom, and texture to voices and instruments. The system sounded so vastly improved that had I not known what had been done, I could have easily been convinced we were listening to an entirely different loudspeaker. As excited as I was by the performance improvements this setup delivered, I could not help but think it was too bad this couldn’t have happened for the public performance! 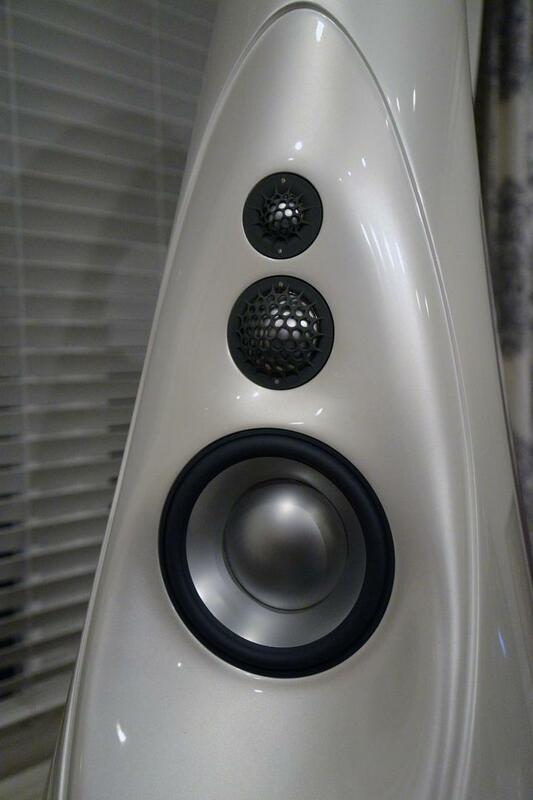 What became clear by the end of our listening was that this is truly an exceptional loudspeaker. Given what I have heard from the original Giya G1 in a number of carefully set up systems over the years, and understanding the degree of improvement the new Spirit offers over the G1, I can overlook this poor showing, much like that of many other shows or demos. While it was not the best product launch I’ve ever attended, neither was it anywhere near the worst. Such events rarely, if ever, give you anything more than a glimpse of the magic that the product(s) under audition may hold. In fact, I am so sure of its potential that I am asking to review a pair as soon as they are available.